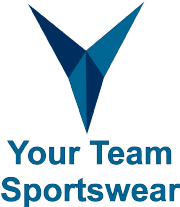 As with all Team Wear suppliers most items on our site are not held in stock by ourselves but we have direct access to all the manufacturers who in general supply to us within 5-10 working days, assuming they have the items in stock. These times may be longer at the busiest period, July to October. So non-personalised items will be dispatched within 24 hours of receipt from the manufacturers. Personalisation will add between 2 & 10 working days to your order depending on the time of year. Again at the peak periods of July to October this may stretch a little longer but we will always keep you informed. Personalised orders can not be returned or exchanged unless the items are faulty. So make sure you get your sizing right! All orders must be via the website or in writing via email. Amendments to orders. Amendments must be received within 24hrs of placement of your order and must be in writing. Any amendments received after this period may incur a 25% surcharge as you kit will have been ordered and will incur a restocking fee. All returns will be at the customers cost as will be the cost of sending replacements or changes of sizes etc. All returns must be pre approved and may incur a 25% restocking fee and must be in their original condition with tags attached and in the original packing or the restocking fee will be 30%. Worn items will not be accepted. Please note it is the customers responsibility to check that all kits and training wear purchased plus any sponsors details and any printing requested is acceptable to your current League or Association. We will just supply what you request. Please ensure you have the right to use any designs and logos used on your kits and training wear. The customer indemnifies the company against any action for wrongful use of designs or logos. Colours of garments may not match exactly as seen on the screen and returns will not be accepted on the basis of the colour not being as the customer expected. All sizing on the website are only a guide from each teamwear supplier, we request customers check sizes before ordering, if unsure please contact us and we can help with sizing. All orders placed is acceptance the sizes are correct. Different cuts will affect the sizing. All logos will be printed to within the sizes allowed in the FA Handbook. Please note that colours will not always match exactly the colours shown on the site as screen resolutions will vary the way colours are viewed however we endeavour to match colours as closely as possible to you original request. Set up fees will be applied if artwork is not received in the correct format. This being a Hi Res Jpeg for full colour logos on a block, EPS/PDF vector file for non Standard sponsors prints. This charge will be levied on receipt of the artwork. Embroidered logos will be as close as possible. A stitched logo will will be sent out with every Embroidery Set Up for customer approval, please allow 10 working days for sample.